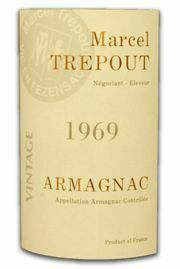 The Armagnacs from Marcel Trépout are raised in the most traditional manner. The brandies are kept in oak barrels of roughly 400 litres for at least 30 years. This ageing allows the armagnac to express all its aromatic complexity and to assume a deep rich colour. Their Maître de chai ensures a constant control of the ageing, barrel by barrel. Once the desired maturity is reached, the Armagnacs are kept in a glass demi-john. All this is done for one reason only, to create an Armagnac of very high quality, exclusively belonging to its own vintage year. Cave-des-grands-vins.com provide a large choice of rare wines , wine grand cru, great wines. Cave des Grands Vins online web merchant : Great wines Burgundy : Domaine Comtes Lafon wines, Domaine Dauvissat wines.